Each time you make a reservation through this website, your reservation is made directly with Misteli Santorini Rooms & Restaurant. As such, you are guaranteed the lowest possible rate, unlike reservations made through third party systems (whose prices include the given platform’s commission). 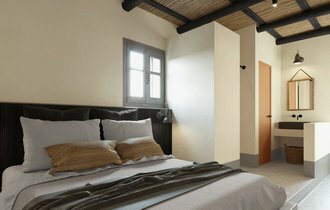 To view rates, availability and make an online reservation directly with Misteli Santorini Rooms & Restaurant click here! You will find Misteli Santorini Restaurant & Rooms at the traditional settlement of Akrotiri, a little way below the Venetian Castle of the village and only 10 minutes on foot from the Red Beach and the archeological site of Akrotiri. Misteli Santorini Restaurant & Rooms features a brand-new restaurant which offers Greek cuisine. 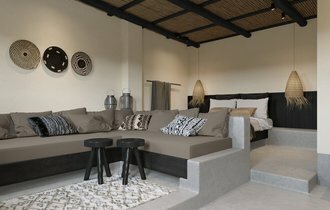 The rooms have a private balcony or courtyard, with a view of the sea or the village, television and air-conditioning. Some provide a kitchen and sitting room. On the veranda of the top floor you will find the Jacuzzi of the hotel, as well as lounge chairs, where guests can enjoy the summer sun. Fira, the capital of the island is at a distance of 10km (6 ½ miles). The airport and port are at a distance of 15km (9 miles).